I've been able to exercise the car a bit more now. I still have some 'issues' with alignment, I will need to make some adjustments. But I am quite pleased overall with the difference the bumpsteer blocks made in the security of the handling. I feel much more confident in the car's ability to hold a line through a corner regardless of the road surface. Instead of having to steer through a bumpy corner, I can set a course and the car will hold it with minimal correction. I can also cross the angling railroad tracks without worrying & trying to anticipate which way the car will dart as we come off of them. Nice, Xander will have to get a set for his car then also. Instead of having to steer through a bumpy corner, I can set a course and the car will hold it with minimal correction. I can also cross the angling railroad tracks without worrying & trying to anticipate which way the car will dart as we come off of them. So what you're saying is that you just took all the fun out of driving the C3. No, just some of the terror! I ordered the blocks from Guldstrand and they are 1/2” bolts with a shoulder that extends through the factory bracket, they are also drilled for safety wire. I bought an extra set of later arms specifically to install the blocks on and the single hole in the later arm must be slightly bigger, because the bolt fits perfectly, but not quite in the 68 arms. So it looks like I just need to drill the second 1/2” hole. I can return the expensive 5/8” bit I bought. Bringing this back from the dead. Just wanted to know if you gained any tie rod knuckle clearance to the inside of the rim? The blocks move the knuckle inward and forward for more clearance, but the downward location could negate that? I want to use less back spacing on an 18" wheel. Less back space or more backspace? Probably best to just lay down in the garage and take measurements off the car. Basically extrapolate what you've got. it's been a number of years, has anyone had any problems with these blocks? do they move the tie rod end away from the wheel? Ciro - what size wheels are you running and do you have flares? Who makes the best ones today? 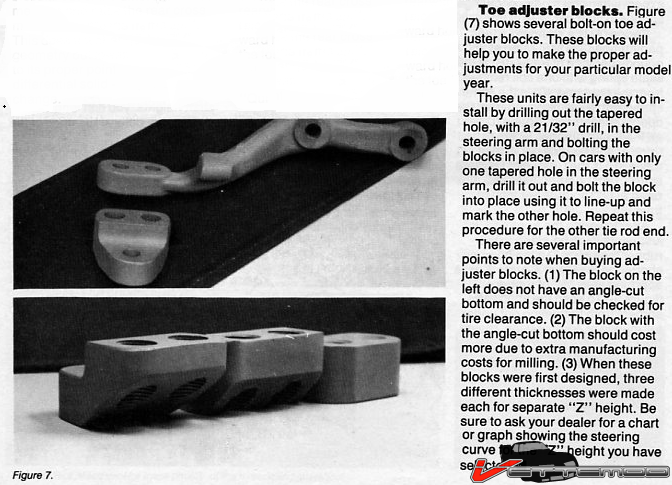 I don't have personal experience with the bump steer blocks so I'll just pass on what John Greenwood had to say about them. As far as I know VB&P is the only one that still sells them although you could easily have some made.